“I never mowed a lawn until I was 22, and now, here I am,” says Mark as he stands in the middle of Flying Onion Farm, a small, diversified farm dotted with do-it-yourself projects. Together, owners Mark and Karen strive to be as resourceful as possible. From logging and building their own barn, to sourcing everything from ducks to greenhouses on Craigslist (Karen claims that Mark is a “Craigslist whiz”), the couple cuts costs and minimizes their impact on the land. The two acres that they use to grow food are part of the 65-acre Mahonia Land Trust Conservancy just outside of Oregon City. This land, featuring rolling hills and picturesque views of Mt. Hood, is protected from careless development and aims to promote outdoor education, sustainable agriculture, and community. Of the 65 acres, 55 of them remain wooded. When Mark and Karen spent their first year on Flying Onion Farm building infrastructure, they knew they had to be exceptionally mindful. Mark explains, “We tried to carve out a little niche without disturbing the land.” Their plans included the removal of several trees to make space for a new orchard and the construction of a barn. So, what was their solution? The couple cleared the wooded area for the orchard and used that same timber to build a barn 20 feet away. This mindfulness carries over to their farming methods, as well. With more than 23 years of organic farming experience between the two of them, Mark and Karen are dedicated to farming in a manner that benefits the environment, as well as the eater. They try to work with—instead of fight—natural systems. For example, they let their small flock of ducks roam the land and eat slugs. It’s a simple act that satisfies the ducks and benefits the plants. While their past farming experience taught them a lot about what to do, it also showed them what not to do. Mark laughs as he explains that working on a 65-acre farm taught him to stay small. The size of Flying Onion Farm gives the farmers the opportunity to “baby” their plants. “A lot rides on everything,” Mark says as he explains how you have to be more detail-oriented when you’re working on a farm of this nature. They take good care of the soil and aim to produce a few high-quality crops without a lot of waste. “We like to think of ourselves as large scale gardeners,” Mark announces, but he quickly adds, “Ok, occasionally we use a tractor.” Mark and Karen like to keep things interesting by growing a wide range of vegetables and a few unusual varieties. They are currently growing a trial plot of overwintering cauliflower for a British seed company. Nobody knows how they will fare in this country, but we’re about to find out. Flying Onion Farm also grows more familiar crops like parsnips, Brussels sprouts, spinach, and carrots (I had the privilege of munching on one of these straight from the ground!). For more photos and information, check out Flying Onion Farm on Real Time Farms! “Village Gardens saved my life,” Helen Nash exclaimed at the nonprofit’s 10th anniversary celebration last Saturday in the St. Johns neighborhood of Portland. 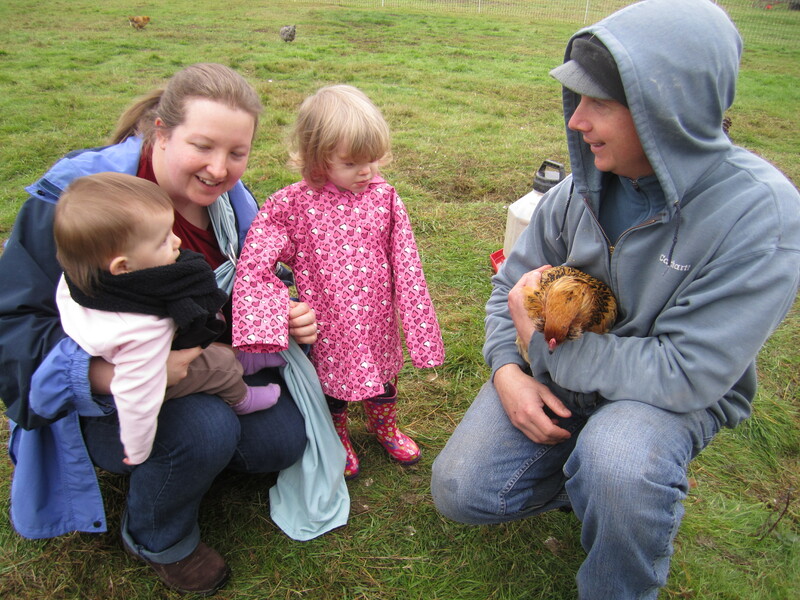 What started off as a simple community garden has grown to affect countless people like Helen with a youth-run organic farm, kids garden programs, a livestock committee, community health workshops, and a healthy corner store. One of the most notable projects, Food Works, uses an urban farm to teach young adults from ages 14-21 about farming, business, community, and themselves. The youth operate a 2.5-acre certified organic farm on Sauvie Island where they grow over 40 different types of vegetables. 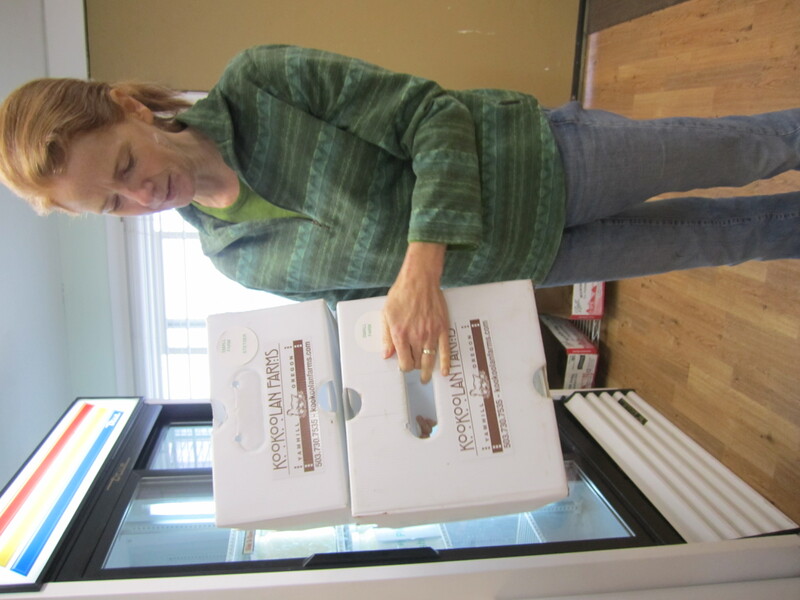 In this past year alone, they produced 12,919 pounds of food. They sold their produce at the Village Market, New Seasons, the St. Johns Farmers Market, and the Portland State University Farmers Market, bringing in a total of $14,000. While those statistics are impressive, they don’t account for the immeasurable impact this program has on its young participants and their community. 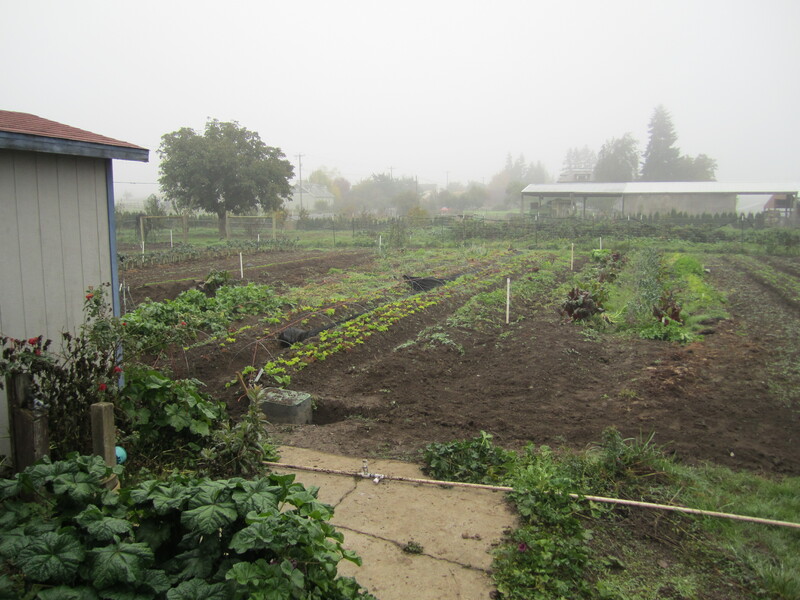 The Food Works youth tirelessly give their time, energy, and carefully cultivated produce to their neighbors. They package oats, beans, and rice at the Oregon Food Bank, volunteer at the community gardens, and pass out fresh vegetables (for free!) every Thursday. The participants learn many job skills, including time management, communication, and leadership. In fact, I watched firsthand as the Food Works youth gained public-speaking experience during their presentation at the 10th anniversary celebration of Village Gardens. These young adults also learn a great deal about nutrition. They learn how to grow fresh vegetables and how to cook them, and in turn, they share these healthy habits with their families and friends, creating a strong, healthy community. The newest installment of the Village Gardens program—the Village Market—offers a consistent outlet for Food Works produce. The market is a “healthy corner store project” that aims to bring fresh produce to the New Columbia neighborhood of North Portland where healthy food is rather inaccessible to its diverse residents. Instead of selling chips, soda, alcohol, and tobacco, the Village Market is a convenient, affordable corner store that offers meats, produce, dairy, and bread. The store also includes a small deli and selection of grab-and-go foods that provide a healthy alternative to fast food meals. The Village Market makes the most convenient option also the healthiest—it’s brilliant! In addition to cultivating physical health, the Village Market also strengthens the health of the New Columbia, Tamaracks, and St. Johns Woods communities. The store is completely run by residents of these neighborhoods, and the staff boasts some of the friendliest people around. I am fortunate enough to live three short blocks from the market, and I can personally attest to this claim. Often, I find myself buying one or two items at a time to ensure that my visits to the store will be frequent. I also make it a point to purchase my bus tickets at the Village Market, even when my wallet is stuffed with one-dollar bills. These decisions all come down to one thing: the people. Sure, affordable, fresh food is enough to bring a smile to my face, but it’s the people who work here that keep me smiling even after I walk out the door. Village Gardens has done amazing work over the past ten years, from Food Works to the Village Market and beyond. Helen Nash explained, “It’s not just a garden,” and as I watched community members talk about foods they’ve grown, meals they’ve shared, and friendships they’ve formed, I began to understand what she meant. It’s not just a garden–it’s a family. 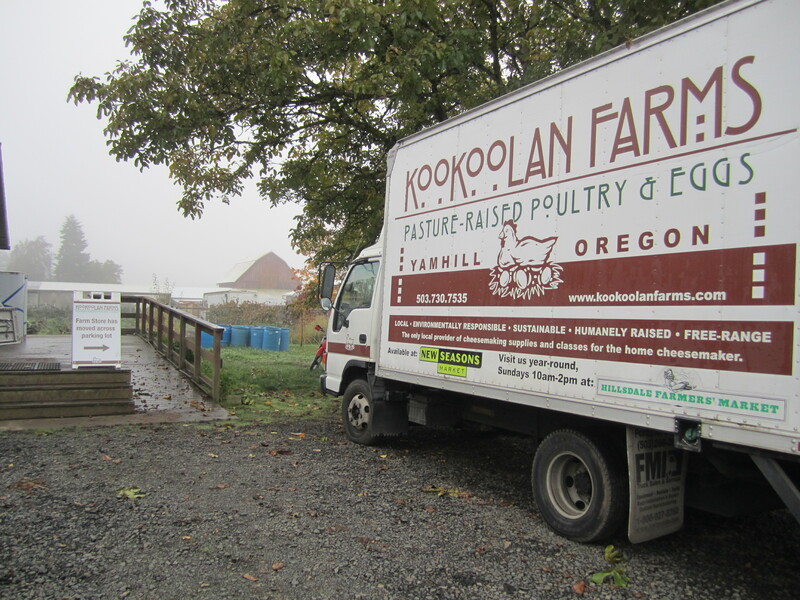 A fellow Food Warrior and I traded in the food trucks, bicycles, and breweries of Portland, Oregon on a rainy Wednesday afternoon for a trip to the farmland of rural Washington. We crossed the Columbia River and drove miles along a winding road flanked by colorful trees until we came upon a quaint log cabin. No, this is not a fairy tale. This is the very real story of Grandma Candy’s Jams, a story about two of the kindest, most interesting people you’ll ever met. Upon our arrival, Murray Falk, Candy’s husband, immediately ushered us in from the rain and announced that he had put the coffee on. They led us to the living room where we all sat down to talk black caps, marionberries, and jam. Originally made with white sugar, the jam recipe underwent a significant change when Candy’s father was diagnosed with diabetes. White grape juice was substituted for the sugar to make a diabetic-friendly collection of spreads. This simple alteration yields a product that is mildly sweet and lets the black cap truly shine. For those still looking to satisfy a sweet tooth, all the jams are made with regular sugar. But that’s it—you’ll find no high fructose corn syrup, preservatives, or artificial sweeteners here. Grandma Candy doesn’t need to rely on anything other than carefully grown berries and a little something sweet to make her delectable jams and spreads. The Falks grow the black caps, marionberries, and blueberries themselves on their property outside of La Center, Washington. Dedicated to producing a completely natural product, they never use any chemicals. Candy, a self-proclaimed “canner by nature” strives to create the highest-quality products possible. After the berries have been picked, she oversees the production of her jams and spreads as they are processed in Newberg. They have a very trusting relationship, as evidenced by the fact that the processor is the only person that Grandma Candy has shared her secret family recipe with. Since Candy tends to the berry plants and manages the processing, it’s up to Murray to run the shipping department for this small business. Did I mention that Murray is a retired mailman? These two people complement each other very well, and that’s evident in the success of their business. What started with selling berries off the front porch has turned into a thriving company with a presence in some of Washington’s biggest farmers markets and bazaars, as well as an online store. To think Candy and Murray have achieved all of this in their “retirement” is quite amazing. Candy retired in 1994, Murray retired in 1996, they began Grandma Candy’s Jams in 1998, and they haven’t stopped since. Murray firmly believes this is the trick to living a healthy, full life: “I would much rather keep moving,” he proclaims. Candy and Murray certainly won’t be letting up anytime soon as the holiday season is quickly approaching. Their days will be filled with Christmas bazaars and shipping orders to loyal customers. The energy and dedication that the couple shows may surprise many, but Murray doesn’t think twice about it. “There’s nothing you can’t do,” he says. After our inspirational visit, I honestly believe it. To learn more about Grandma Candy’s Jams, visit their website and their profile on Real Time Farms! Ambacht Brewery, located just outside the IPA-crazed city of Portland, is not ashamed to tell people they do not make an IPA. In fact, they consider it one of their main selling points. Tom laughs as he explains how he and Brandy bought the brewing equipment before they decided to open a brewery. Tom used to volunteer at Tuck’s Brewery, and when the space was turned into a synagogue, he bought the equipment from them. This was a bold move, considering neither partner had been in the business before. This transaction took place about five years ago, and the partners have been busy ever since. The equipment now resides in Ambacht’s cozy 1200 square foot brewery in Hillsboro, where the owners brew every three weeks (not everyday like larger operations). The small brewery is dedicated to sourcing organic ingredients from local farmers. They use organic malts, buy honey directly from a local beekeeper, and drive down to Goschie Farms to pick up their hops. Goschie, like many other hops farmers in the region, used to sell to Budweiser. But after a Belgian company purchased the beer giant, “a lot of hops farmers had to tear out their vines,” Tom explains. In supporting these local farmers by using their ingredients, Ambacht crafts dry beers that get a hint of sweetness from honey. Tom explains that their process “leaves flavors that make you think sweet—I call it virtual sweeteners.” This occurs because honey is 100% fermentable. At the end of the brewing process, there is not a lot of sugar that has not become alcohol. Hence, it makes you “think sweet” without actually containing an overwhelming amount of sugar. The brewer tells us that most beers “would be sweeter than Coca-Cola without hops.” At Ambacht, they strive to achieve balanced beers without relying too heavily on the hops. Tom claims that people can suffer from “beer burnout” if they saturate their tastebuds by drinking hoppy IPAs all the time. He wants Ambacht to be the beer people turn to when they need to give their tastebuds a break. “That way, they don’t have to resort to Coors,” Tom jokes. Currently, the Honey Triple is brewing, and it is scheduled to be ready next spring or summer. When I asked Tom if investing this kind of time (and money) into a process with uncertain results makes him nervous, he replied, “It’s not nerves, it’s more like, ‘How do I schedule this beer?’ and ‘I need more space!’” With the growth Tom and Brandy have experienced in the past year alone, more space might not be out of the question. Previously, their brews were only available at farmers markets, but this year you’ll be able to find them in New Seasons Market. Whether you’re an IPA fanatic looking to give your tastebuds a break, or you simply like a sweeter, more balanced beer, Ambacht is crafting the beverage for you. Find out what they’re brewing on their website and check out their profile on Real Time Farms! Matt showing farm tour participants one of the chickens. Matt Schwab knows his animals. And I’m not referring to the kind of knowledge that allows him to rattle off countless facts about each breed of turkey, duck, pig, chicken, sheep, or cow he raises on his farm (which he surely can do). I’m talking about the kind of intimate understanding that allows Matt to provide the best environment possible for each individual animal. “I’ve always been a bit of an idealist, and farming this way combines a lot of my interests,” claims Matt as he explains what motivated he and his wife Jen to create Inspiration Plantation. Matt studied horticulture in college and worked as a landscape contractor for 14 years, developing a deep interest in working with the natural environment. He eventually began to question where his food was coming from, and curiosity led him to The Omnivore’s Dilemma. The book introduced Matt to a revolutionary farmer named Joel Salatin who owns Polyface Farms, a diversified farming operation located in Virginia. Matt proceeded to read all of the farmer’s books, learning about growing practices that require little investment, utilize recycled materials, and actually heal the land. 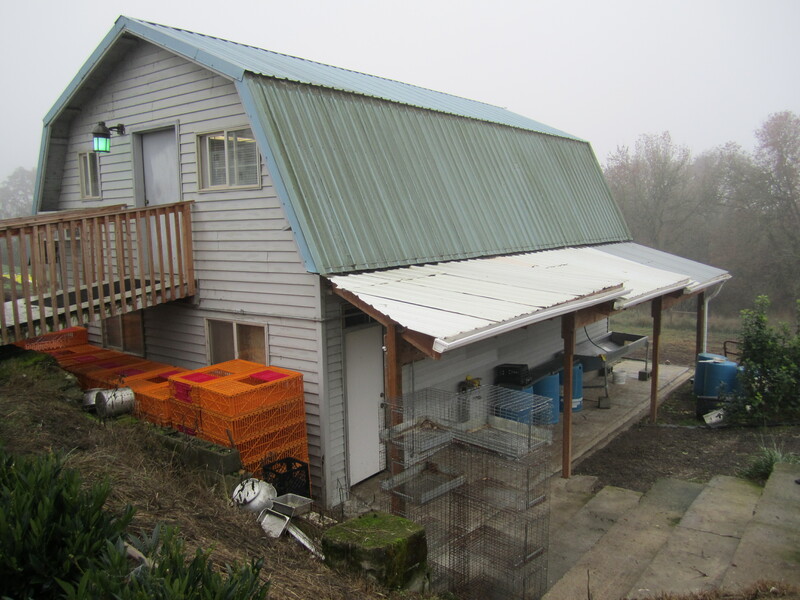 So when the Schwabs inherited property in Ridgefield, Washington seven years ago, they decided to “opt out” of the conventional food system and start growing their own food following Salatin’s model. The laying shed that Matt moves once a week. This model allows animals to freely express their natural personalities while healing the land through rotational grazing practices. Matt uses a portable poultry pen to house his meat chickens, and he moves it to a new spot each day. Even the much larger laying shed is mobile. Thanks to a base made from telephone poles, Matt can slowly move this structure with his tractor once a week. This method utilizes the inherent activities of the animals (eating and creating waste) to naturally rejuvenate the land. Rotating the structures on a routine basis allows this maintenance to be spread evenly across the property. The diet each animal consumes is simple, as well. Cows and lambs spend their days grazing on “green salad” (pasture), while pigs mainly eat barley and are finished on delicious treats from the orchard. 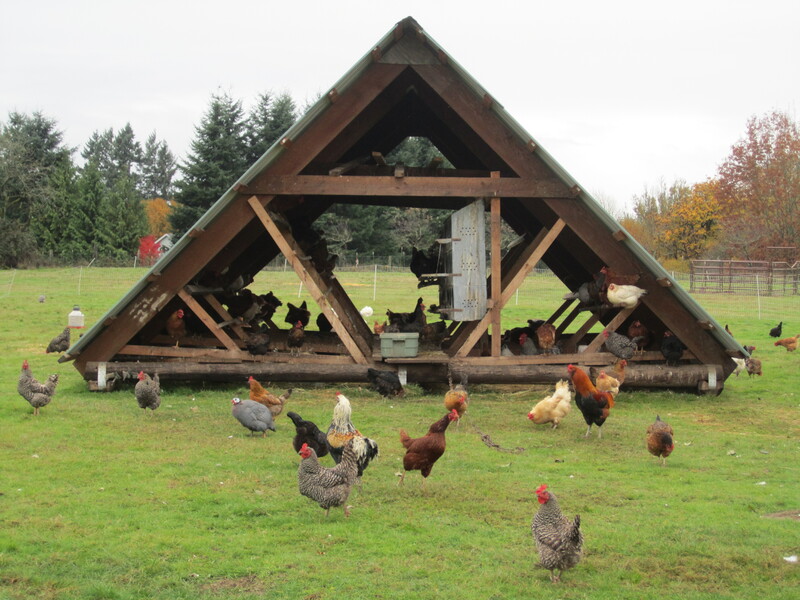 Chickens, turkeys, and ducks receive supplemental organic feed from a local mill. When asked if he ever administers antibiotics, Matt responded, “My philosophy is that if an animal gets sick, I’m doing something wrong. After all, I’m the one controlling their environment. It forces me to understand the animal and do my homework.” All poultry is processed on the farm, and larger livestock is pasture-killed by a mobile butcher to ensure a humane, stress-free harvest. 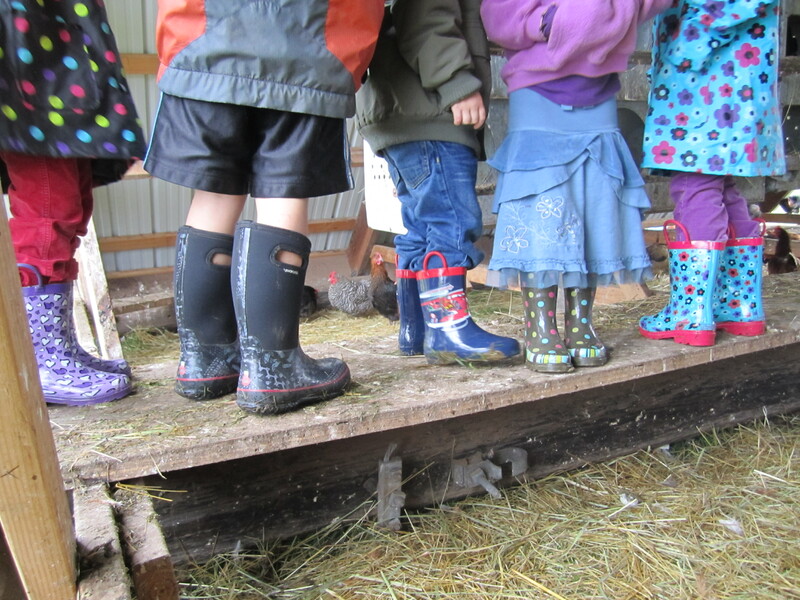 The next generation of curious eaters prepare to explore the muddy laying shed. All of these practices point toward organic certification, but the Schwabs are not interested in pursuing it. “We’re not certified organic because we don’t need to be; people can come to the farm and see for themselves how we care for the animals,” Matt explains. It is this transparent policy that led me, as well as a dozen other curious eaters, to Inspiration Plantation on a cold, rainy Saturday afternoon in Washington. Every month, Matt and Jen invite their customers to a farm tour so they can get a clear understanding about where their food is coming from. 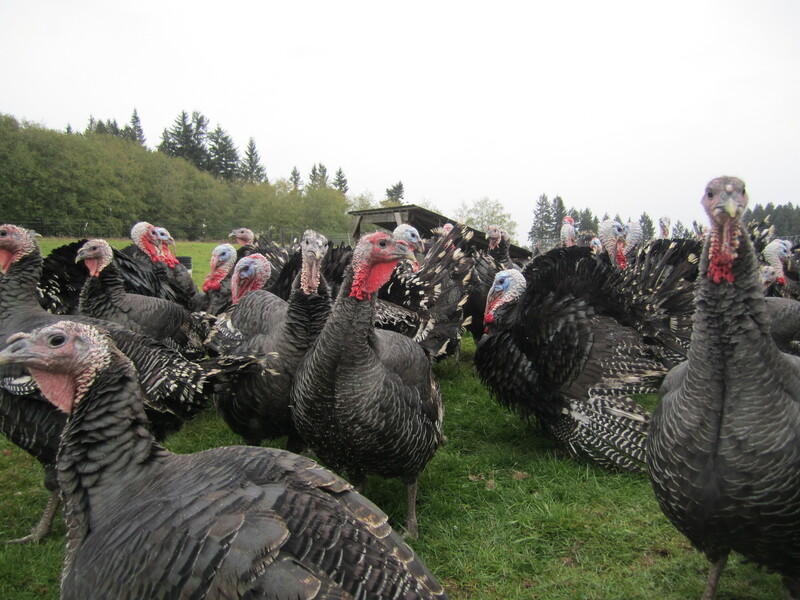 The lively group of broad-breasted bronze turkeys. The colors in their faces change according to how long they hold their breath. On this particular November tour, we got to see several incredibly vocal broad-breasted bronze turkeys. Soon they will be harvested to become the centerpieces at Thanksgiving dinners across the region. Thanks to Matt and Jen’s dedication to humane animal husbandry, diners will be able to enjoy their meals with peace of mind. And that’s something to be truly thankful for. Happy Thanksgiving! To find out more about Inspiration Plantation and subscribe to their mailing list, visit their website. You can also check out their profile on Real Time Farms to see more photos and farmers market information! The vegetable garden at Kookoolan Farms. All of the compost used for fertilizer comes from the farm itself. The farm store that boasts a large selection of cheesemaking supplies, and the chicken processing area below. Determined to provide complete transparency amidst a world of translucent and opaque meat operations, Chrissie has disclosed in full detail all of the humane and sustainable practices on the Kookoolan Farms website. While many farms are catching on to the idea of giving animals quality lives by pasture-raising them, there are still few farms that follow up these efforts by humanely slaughtering the animals. Chrissie showing off the different sized CSA boxes. For more information on CSA shares, purchasing meat, cheesemaking classes, or finding Kookoolan Farms at farmers markets, check out their website and their profile on Real Time Farms! Sid Bone, owner of Greenville Farms in Forest Grove, Oregon, explains how he and his wife Luann started farming. What is now a flourishing farm came from humble beginnings. Sid reminisces about that very first farmers market and explains his current methods for crop rotation. For more information and photos, check out Greenville Farms on Real Time Farms!